Place the refried beans, 1 teaspoon olive oil and water in a medium saucepan, cover and heat over a low flame, stirring frequently until hot. While the beans are heating up, heat the remaining 2 teaspoons of olive oil in a medium skillet and sauté the onions for 5 minutes until translucent. Add the peppers and shoyu. Sauté another 5 to 7 minutes until tender. Remove and place in a serving bowl. Prepare the tofu sour cream, place in a bowl and set aside. 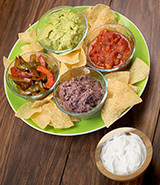 Place one cup of corn chips on each individual serving plate. Top each serving with dabs of hot refried beans, salsa, sautéed onions and peppers, and tofu sour cream. Any other favorite toppings can be substituted for the above or used in addition to the above toppings.